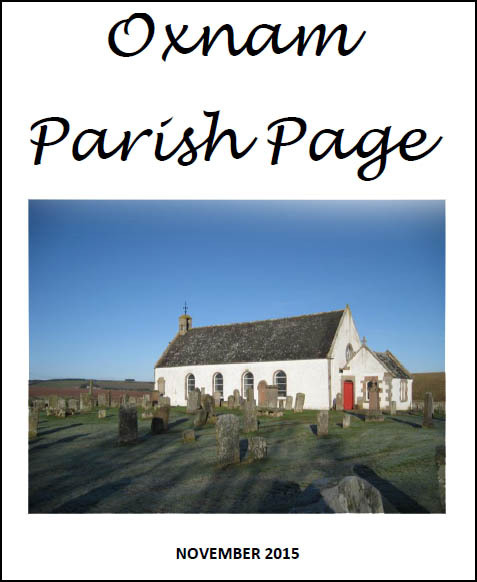 The Parish Page is the Kirk’s newsletter and is published in both printed and electronic formats. It gives a wide variety of information on the Kirk’s activities and is a great guide to finding out what’s been happening in the Oxnam local community. You can read any of the previous Parish Pages by clicking on the links below. These will open a pdf file in a new window. Just close that window to come back to this page! At the Presbytery meeting in October it was finally agreed to sever the link between Oxnam Kirk and Kelso Country Churches and we are now back to our previous position of being under Guardianship. In the future we look to having closer links with other churches nearer to home. Recently, at the request of the General Assembly, Presbytery asked all Kirk Sessions to consider questions about the future shape of the church in their area. Our Session had a very positive and productive discussion on this and we look forward to sharing our responses with the other Kirk Sessions in the Jedburgh area in the New Year. We are delighted that our locum minister the Rev. Marion Dodd is recovering so well from her knee operation and that she was able to return to Oxnam Kirk at the beginning of October. During her absence over the summer we enjoyed a great variety of services as we welcomed the Ruberslaw Worship Group, Rev. Sandy Young, Mrs Winnie Robson and Mrs Dagmar Knox to lead our services as well as having our own Worship Group giving us an interesting insight on King David. Marion told you about our new Family Link Group in the last Parish Page. Following on from our initial meeting we held a very successful Family Walk and Picnic at Harestanes in September and our Harvest Festival Service was a special shorter family friendly service in which the children were encouraged to take an active part. The church had been beautifully decorated by Beryl Barbour and her team. A huge thank you to them all. As usual we held a Remembrance Service at the beginning of November then on Sunday 11th November at 7.05 pm I hope you were able to come along to take a turn ringing out our bellat Oxnam Kirk, along with 1000 cathedrals and churches across the nation, we rang out our bell in celebration of Peace and in tribute to the millions of men and women who died or were injured in World War One. The Family Link Group are also planning a Kids Christmas Crafts morning on Saturday 1stDecember which should be lots of fun. If you have children another must for your diary is Sunday 20thJanuary 2019 when the Northumberland Theatre Group will be producing the tale ‘The Little Maid Who Danced to Every Mood’ at 3pm in Oxnam Kirk. This is bound to be a sell out so book early to avoid disappointment. The pantomime is not just for children – it should be fun for all the family! Val Hunter is organising our Christmas Bazaar for Saturday 24thNovember from 10 am until 12 noon in Oxnam Village Hall. Please do come along and support this event. We also look forward to seeing you at one of our Christmas services. The Christmas Eve Carol Service will be held on Monday 24thDec at 5 pm and on Christmas Day there will be a Service with informal communion at 10.30 am On Sunday 30thDecember there will be a service of 9 Lessons and Carols. As I write this the sun is shining and it is another glorious summer’s day – it is hard to imagine that the snow made it almost impossible to get to Oxnam Kirk on a couple of Sundays during the winter! The search for a minister for the linked charge of Oxnam and Kelso Country Churches continued throughout 2017 with the nomination committee exploring all avenues open to it with no success. There was a growing feeling in both parishes that it would continue to prove very difficult to attract candidates for a 0.75 ministry taking into account the distances involved. After a joint session meeting with Kelso Country Churches in December, the decision was reached to ask the Presbytery of Jedburgh to sever the linkage of Oxnam Kirk with Kelso Country Churches to enable both sides to look at other options. In April Presbytery requested that Oxnam Kirk Congregation take a vote on the breaking of the linkage with KCC and this was done before the Stated Annual Meeting on Sunday 15thApril. Following questionsand discussion all the congregation present voted for the motion with one abstention. Following this the motion was passed by Presbytery at their meeting on Wednesday 2ndMay 2018 and has now gone to the Presbytery Planning Task Group at 121 George Street for their approval. If this is given, Oxnam Kirk will return to Guardianship and then be able to seek linkage with churches closer to us. Luckily for us Marion is happy to continue as Oxnam’s Locum Minister. The Kirk Session and congregation are so grateful for her dedication, hard work and enthusiasm in both the Kirk and the Oxnam community. She will be going in for a knee operation on 11thJuly so unfortunately for us will be out of action until September. As I write this we are busy finding others to take our summer services. Luckily the Worship Group were already planning to lead the service on 5thAugust – we’ll now just have to do it without Marion there to advise! Reverend Robin McHaffie stood down as our Interim Moderator in December and the Kirk Session would like to thank him for all his help and guidance over 2016/17. We welcomed Helen Howden as our new moderator in January. You may know her as she was HR Manager of Mainetti in Jedburgh for many years and is an Elder in Ruberslaw Parish. At the packed Christmas Eve service it was a delight to have so many children dressing up and performing their own song. Well done to them and their mums! This year the Christmas Morning and End of Year Services both included a simple celebration of Holy Communion which was much appreciated by those who attended. In January the Northumberland Theatre Group once again entertained an enthusiastic audience. It was wonderful to see the Kirk so full of people having such an enjoyable, fun afternoon. Many thanks to Moira Land for all she did to make this now annual event such a success and also to all who helped Moira, including Francis Armstrong who fed the cast and others! Moira has already booked the Northumberland Theatre Group to return in January 2019. Valerie Hunter continues to lead Sunday School on the occasions when children join us on a Sunday morning. It was lovely to see so many of them there on Easter Sunday morning enjoying her Easter Egg Hunt. On 22ndMay a special Cradle Roll service was held and we welcomed back a number of children who had been baptised in Oxnam Kirk along with their families. Moira Land had decorated the kirk with balloons and Marion’s delightful service was enjoyed by adults and children alike. During the service Val presented the children with a little gift. Moira Land continues to be our very active Presbytery Elder. Last year she took the initiative of making a short video film of life in and around Oxnam Kirk as part of a Church of Scotland competition. Although she did not win the organisers felt there was much to enjoy in the video and have uploaded it to the main Church of Scotland website. Very well done to her! With her encouragement we have continued to record the life of Oxnam Kirk. Look out for this video later in the year. This year’s Moderator at our Jedburgh Presbytery is Anna Rodwell. We all know Anna really well having been our minister at Oxnam for many years. Anna is taking an interesting new idea forward and asking elders to address the Presbytery. This has a much less formal feel to the meetings with a more modern approach. Oxnam Church is now under Guardianship for at least two years. Good news for Hobkirk and Southdean linked with Ruberslaw – they have a new minister, Rachel Wilson, who will be ordained in Denholm on 6th December. 1. Discuss and prepare a presentation on the future shape of ministry in their area. 2. Organise and get together in area groups with other Kirk Sessions and hear their presentations and to formulate a response to Presbytery by September 2019. The Church of Scotland has 1,300 congregations and 3,000 churches and not enough ministers. Headquarters in Edinburgh realise they need a “radical change of plan” and “action“. Ideas from anyone are welcome. The Jedburgh Presbytery meets most months on a Wednesday evening to discuss important church matters and the future and allocation of posts and churches. For the past two years Oxnam has been linked with Kelso Country Churches trying to find a 3/4 ministerial post. They have not been successful finding a candidate and, after much discussion on both sides, and also together, it was decided to break the linkage. Kelso Country Churches are now free to call 3/4 minister on their own. Oxnam Kirk will now have to consider their way forward. The Church Of Scotland has a huge reduction in ministers coming forward to be trained and this is presenting problems in filling posts. At present, we have only 5 ministers (3 in Hawick and 2 in Kelso), this leaves us with 6 vacancies. There is talk that our allocation may be reduced from 11 posts to 6.5 posts . will be able to ask any of these trained elders. Presbytery is encouraging churches and congregations to “engage with young people “8 to 25 year olds to give them a platform to talk about their needs and wants . Oxnam is having some events to encourage the Young People .